Ian, our English friend with mad chainsaw skills, came for another week. We’ve pretty much got our 2016 veggie field clear now, save a few “danger” trees that we’re saving for when the Man with the Machine comes, rather than risk dropping them on buildings or power lines. Other friends came to stay for a busy weekend of chipping branches – 18 hours of chipper time! We have amazing friends. It is very exciting to see the sun coming in and the field space taking shape! Soon, we’ll get the stumps pulled and the site root raked. Then, this summer, we’ll work on improving the soil with livestock, compost, and cover cropping. Dan helping us to feed the hungry hungry chipper (left). Sun and view all the way to the road in the 2016 field, and a pile of brush turned into pile of chips (right). The chips will get spread around the field area, some long-term organic matter for the soil that will get released over the coming years. The pigs loved destroying stumps and logs in a forest run, and then basking in the sun for a few weeks on the freshly cleared field area. They grew very fast this past month, weighing in well over 200lbs by the beginning of May. We have very much enjoyed their antics and personalities (have a look at our instagram feed or facebook page for a fun video of the ridiculous “Messy Pig”), and were sad to say goodbye when we took them on their final journey to Gunters this past week. Luckily, our (awesomely free!) trailer waited until after we dropped of the pigs to spring a leak in one of its tires. We are missing our pig ladies, but looking forward to trying our first pork in two weeks. The pigs in their forest run (left) and on the 2016 field (right). Proving they can (just barely) all still eat out of one trough at 200lbs each. The cabin is finished, the house coming along. The cabin had a leaky lean-to taken off the back and the back wall shingled, roof and wall leaks sealed up, new appliances, faucet and woodstove installed, new composting toilet built, a deep clean out and in, and a lick of paint. She’s a much cheerier place. Our tenant moved in mid-April and we’re enjoying our new neighbour. The house windows were delivered this week, so we’re now close to having the north section of the house ready to be insulated and sealed up again. Our bedroom is in the north section, so we’re currently sleeping in our dining room while the renos are happening – the race is on to see whether we’re back in our room before baby arrives! The cabin, ready for its new occupant (left). 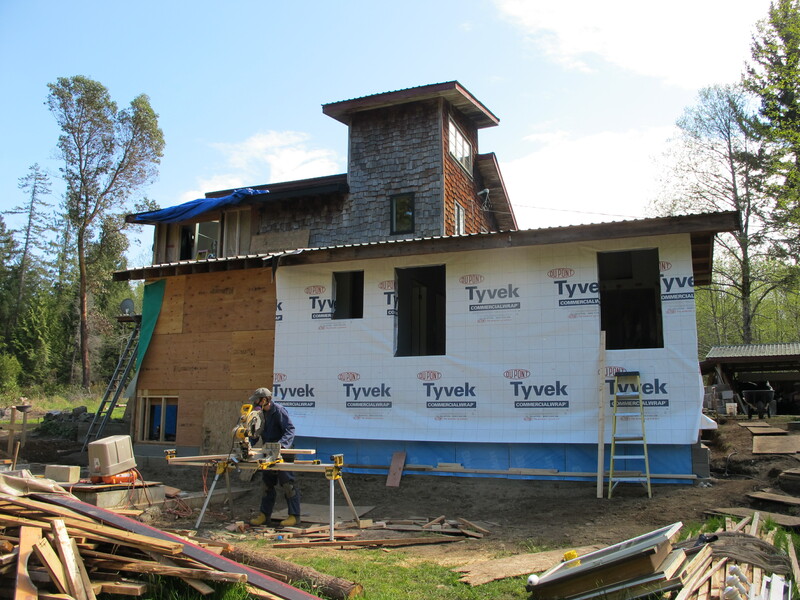 The north side of the house, waiting for windows (right). Back in February, we ordered the seed for this year’s experimental garden. We are trying several types of many different vegetables to see what grows well and what tastes delicious. Not having a greenhouse yet, and already feeling very behind, in early April we started some plants for our experimental 2015 garden up in a spare bedroom. We used soil blocks to start our seedlings, and while they take a bit more time to make than filling plug trays, we have once again been very impressed by the germination rates, root formation and transplant success we’ve seen so far. We’re going to have to decide whether the extra time it takes to make them is worth it for future years; this year, having more time than money, saving on trays makes sense. The bedroom-greenhouse worked less well; while the plants seemed to enjoy germinating up there, they were less keen once they started growing. We had been hoping that the south facing windows and skylight would be light enough, at least until the greenhouse steel arrived; our very leggy seedlings told us it was not. Happily, we now have greenhouses, so won’t have to start things indoors next year. Looking in on our seedlings in the house. As many as we could fit were moved to the dining room window to try and slow down the leggy-ness. Thanks to help from our local building supply centre, we finally figured out how to get the 21′ lengths of greenhouse steel to the farm without breaking the bank. So last weekend, we borrowed a bender and put up two 50′ greenhouses using the pattern and bender from Johnny’s. We’re pretty happy with the results. We spaced the arches 4′ apart – close – so that our greenhouses can stand up to some snow load, meaning we can leave the plastic on and hopefully grow some tasty veg through the winter. We moved all our leggy seedlings out of the house and into the greenhouse, careful to watch the temperature so we didn’t shock them too much. Unfortunately, we didn’t think about sun… and much like us turning red on the first sunny spring day, our seedlings got a bit scorched – and stressed. A lesson learned that cost us about half our tomatoes and herbs, almost all of our peppers, eggplants, cucumbers, onions and leeks, some cabbages, and a handful of the squash, brassicas, lettuces, celery, chard and beets. A frustrating start. But, things are looking up: after a week of watching things die, the plants that remain have started to grow some true leaves, and we’ve got several flats of newly seeded tomatoes, peppers, eggplants and cucumbers germinating on a heat mat to hopefully make up some losses. So, we will have veggies – though no one will accuse them of being early. Which may be just as well, as we are still waiting for the walk-behind tractor we ordered to ship…. In the meantime, we’re starting to ask around to see if we can book some time with a neighbour’s tractor. Sam staking out the locations of the greenhouse posts. Photos of the erected steel frames and finished greenhouses can be seen in our instagram feed on the right. On the To Do list for this month: building some chicken infrastructure and ordering some chicks, welcoming three new pigs (we’re trying a few Denman pigs, after a Berkshire supplier fell through), setting up our 2015 garden and getting the seedlings into the ground, direct seeding some beets, carrots, greens and beans, and welcoming a new member to the Two Roads team. Phew!